I know, I know, the holidays have already begun, but maybe you’re looking for a last minute treat for your neighbors, to bring to a holiday party, or for your New Years Eve celebration. Growing up in Indiana, someone always brought a plate of buckeyes to the house, or to my grandparent’s and now my friend Beth always makes Buckeyes and stores the extra in the freezer (they’re wonderful frozen!) 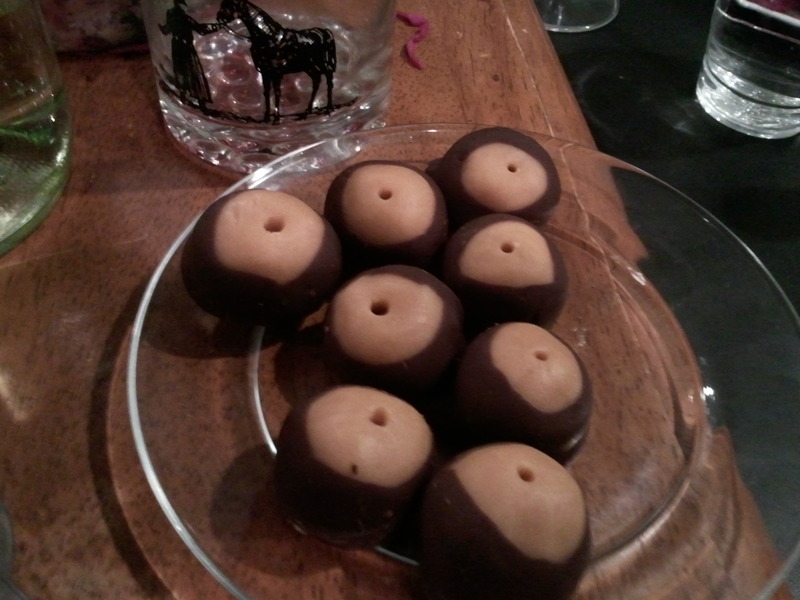 These candies are called Buckeyes because they resemble the nut the falls from the Buckeye tree, so common in Ohio that the citizens from that state are called “Buckeyes.” Easy to make, easy to love. Enjoy! Beat the margarine/Crisco and the butter until full-mixed and smooth. Add the peanut butter and beat well. Add enough powdered sugar (about 1/2 bag) to make a stiff dough. Refrigerate the dough until cold, 30 – 45 minutes. Rolling 1-2 Tbs. of dough between your palms, forming balls. Refrigerate again, until hard. Using your fingers or a toothpick, dip each ball into the melted chocolate, leaving a circle of peanut butter uncovered at the top (and the candy resembling a buckeye).